What type of fish are Arbroath Smokies made from? Authentic ‘Arbroath Smokies’ can only be made from haddock. What is the difference between an 'Arbroath Smokie' and a kipper? 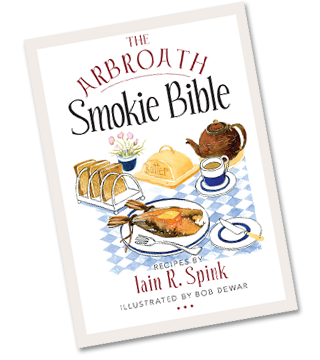 An ‘Arbroath Smokie’ is a hot-smoked haddock, whereas a kipper is a cold-smoked herring. The hot-smoking process cooks and smokes the fish at the same time. The cooking/smoking time is approximately 40 - 60 minutes, after which time the fish is ready to eat. Cold-smoking takes place usually overnight, after which time the fish is only flavoured with the smoke, and the fish requires further cooking before consumption. Virtually any hardwood can be used, but each ‘Arbroath Smokie’ maker has his own preferred hardwood. My personal preference is an oak/beech mixture, which I find gives a pleasant, subtle smokey flavour. As stated above, approximately 40 - 60 minutes. However, there are many variables which may affect the cooking time, such as humidity, wind, size of fish, dryness of the wood, to name but a few. How long will they keep? Can they be frozen? After getting them fresh from the barrel, they can be kept refrigerated for up to 7 days. Alternatively, they can be frozen for up to 3 months if packed and stored properly. What's the best way to pack them for storage in the freezer? The Smokies need to be tightly wrapped; squeeze out as much air as possible to help prevent freezer burn. Ideal packaging is a plastic freezer bag - make sure that they are tightly sealed, and label with date of freezing. Ideally freeze on day of purchase; the sooner they are frozen, the better the condition of the food when thawed. When required for use, remove packaging and thaw overnight in the fridge..
How do I cook them? Can they be reheated? A Smokie can be eaten cold, or reheated in the microwave for a couple of minutes. For more information and ideas, please refer to the Recipes page.